We assume the folks staging the rally probably left their thatch tents early this morning since they obviously must be walking to their rally against fossil fuels in Boulder. According to an Energy-in-Depth piece, the City of Boulder will announce the filing of a climate-related lawsuit targeting ExxonMobil and SunCor in partnership with EarthRights International, which will pursue the litigation pro bono on behalf of the city. It is expected that Sierra Club, Earth Guardians, and 350.org will join in the merriment. We assume they also started walking early this morning, too. Who are they suing and what constitutes damages? In other cities in which they’ve tried this stunt, the damages were the result of climate change-induced rising sea levels in coastal cities. We don’t have that problem here. Who is funding this lawsuit? ERI has financial ties to several anti-fracking organizations, including George Soros’ Open Society Foundations, the Rockefeller Family Fund, the Rockefeller Brothers Fund, the Tides Foundation, and Tom Steyer. If this lawsuit is successful in shutting down the oil and gas industry’s attempts to frack in Boulder, who will compensate mineral and royalty owners? 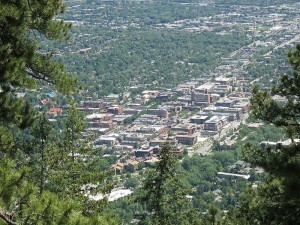 Boulder could be on the hook for billions. Are the proponents of this lawsuit betting that Democrats keep the Governor’s mansion and take the Attorney General’s seat this November? Is this lawsuit timed to coincide with a period of transition in the executive branch of Colorado? Have any of the lawsuits brought forth by ERI been successful? We know the answer to the last question. The legal community already has called out these lawsuits because they’re frivolous and do nothing to advance the environmental cause – they only serve as a nuisance and entangle Boulder in further legal foibles. « LIAR, LIAR? Did Jason Crow Lie to Vox about Residency at Time of Aurora Shooting?